Dear customer, we want to announce you that due to our development and product renovation we have decided to elaborate a new design for our Oral BodyPharm products. The new design is already launched on the market and soon will replace the old product design. We want you to know that in case the official retailers present you the old design do not worry, this is because they still have the old design products in stock, but soon they will be replaced with the new one. 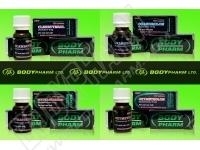 BodyPharm is in permanent development and modernization due to the market rules and customer higher demand. We aim to be the best for your health and wellbeing.